What's the objective of the marketing efforts? What tactics have already been used? What additional tactics should be tried? What is the target market, by demographics and geographic locations? Where are the geographical areas that should be targeted? Which metrics should be used to track results? What is the budget for each tactic? Keeping the discussion open to new ideas will provide the best, most effective solutions. However, if some of the tactics you've already used are working, it's best to keep those tactics in the mix as you add new ways to advertise. Keep the good stuff going and broaden your approach as you aim for more sales! 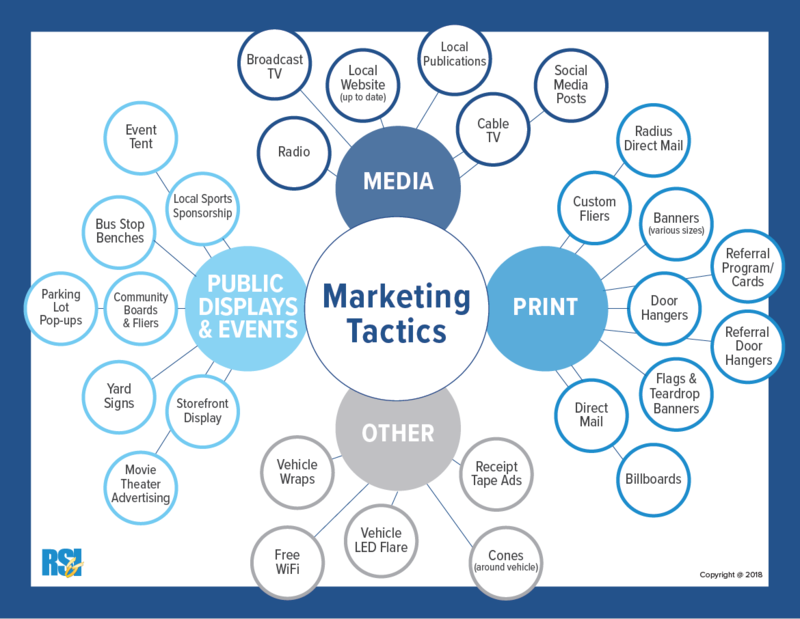 In a quick summary, marketing tactics can be broken down into four different categories. Radio, cable and broadcast TV, local website, local publications, and social media posts all fall into this category. Local sports team sponsorships, event tents, yard signs, parking lot pop-ups, movie theater ads, storefront displays, and community boards should all be considered as you keep thinking of your possibilities. Direct mail, door hangers, banners, referral cards, flags, and billboards are among the variety of print advertising options that can be used. After all these tactics, you can still consider using vehicle wraps, LED vehicle flares, receipt tape ads, labeled vehicle cones, and free WiFi at your location to draw even more attention to your business. 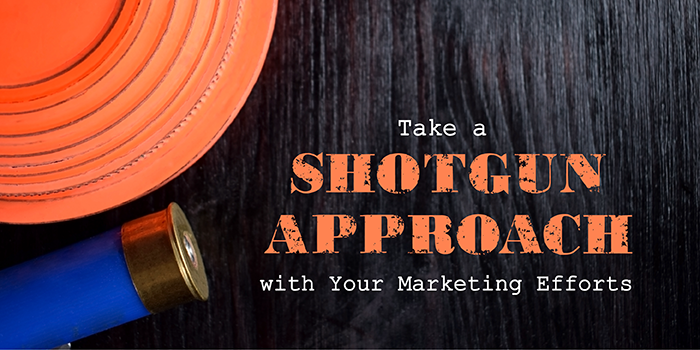 You can start to visualize an actual "shotgun approach" as you identify a variety of ways you'll be advertising your business next year. Remember to think of each tactic as just one pellet in a shotgun shell. Collectively, you'll be able to hit the target and generate an incremental amount of sales. If you like our marketing tactic idea sheet as pictured above, feel free to download it and take it to your next brainstorming session. You will likely think of even more ways to get the word out about your products and services, beyond what we have included. The bottom line is to diversify your marketing and stay consistent with each method to be successful. The more tactics you use, the more sales you are likely to get! If you are considering becoming an authorized retailer, let us know how we can help with your marketing efforts and feel free to contact us.